A multi-talented musician from Masterton, New Zealand, Jamie has played with great Blues, Jazz, Funk and even Heavy Rock bands in his days. He flew to Australia in 1978, obviously like many Kiwis who migrate here, looking for work that paid you deservedly for your efforts, and has been here ever since. Jamie is the eldest member in the band and brings a wealth of music knowledge. 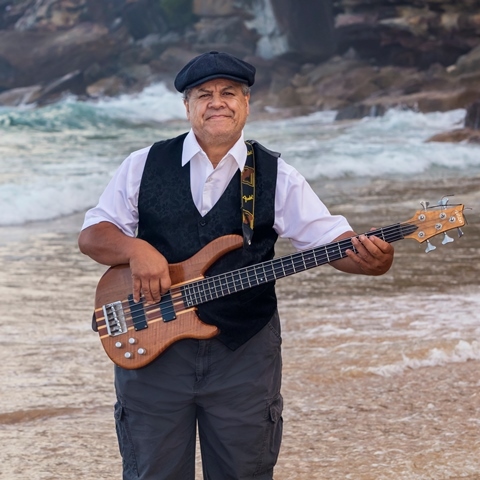 A great vocalist and one of the best Bass players we have here on the Northern Beaches, in fact, in Sydney. Affectionately named ‘JIMBO’ he is the ‘heart beat’ of Kotahi Groove.